When can a sports promoter be liable for selling a product to the public based on lies? Reasons for judgement were recently released grappling with this issue. Last month the United States District Court, Central District of California, dismissed a class action lawsuit from purchasers of the Pacquiao v. Mayweather Pay Per View Bout. In short a class action was brought arguing that Manny Pacquiao fraudulently concealed a known shoulder injury prior to the bout. 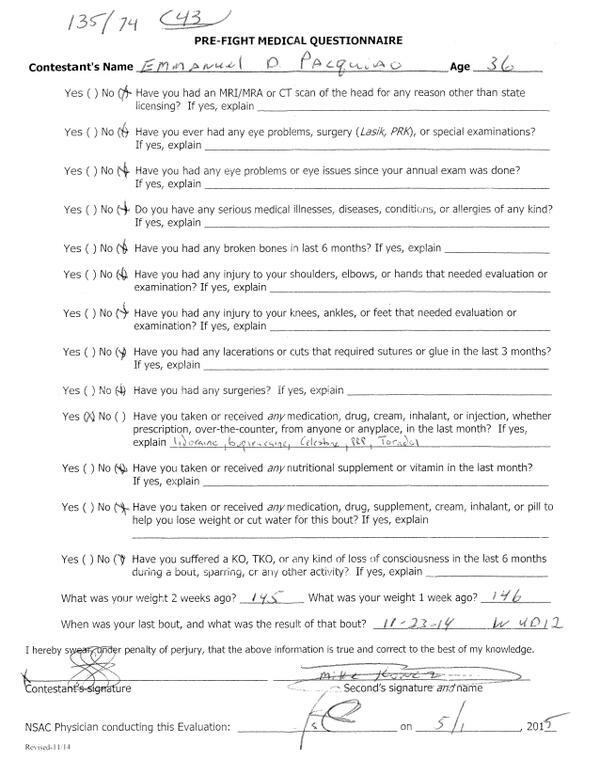 Indeed he lied about the injury, under penalty of perjury, on his pre-fight medical questionnaire. Additionally there were the usual pre-fight boasts to the public suggesting Pacquiao was “conditioned 100%” “never in better shape” and in “pristine condition“. The bout went on to a unanimous Mayweather victory and was a fight that, in the eyes of many who purchased the program, fell short of the hype. The Plaintiffs argued that they would not have purchased the bout but for this fraudulent misrepresentation. They suggested that “the Defendants were motivated by huge profits to conceal Pacquiao’s injury from the public…to boost ticket, pay-per-view-subscription, and closed-circuit-distributorship sales“. The Court dismissed the lawsuit and in doing so struck a sensible balance. In short the court held that a misrepresentation or omission that is related to competitive strategy or the quality or outcome of competitive performance will not be legally actionable. The Court noted that the purchasers of the program got exactly what they paid for, namely “the right to view whatever transpired“. The Court went on to state that this dismissal should not serve as “a blanket pardon for the malfeasance of athletes or sports organizations“. It was noted that sports promoters can be held legally liable in cases of “misrepresentation concerning its business strategy or financial health“. However, misrepresentations related to the core of athletic competition are immune from litigation.